3 Petabytes of data. That’s almost 40 years of HD-TV video or close to 690,000 DVDs. It is also how much data Grab has accumulated from the 2 billion+ rides we have facilitated over the past 6 years. And with all that data comes a major opportunity – to make transport smarter in cities all across Southeast Asia. We’ve teamed up with NUS to launch the Grab-NUS AI Lab, which will bring together some of the best minds in artificial intelligence (AI) and the strength of our data to tackle transport challenges in the region – whether it’s making sure you get the rides you want, to cutting down the time you spend being stuck in traffic. “With this project, we want to see how we can bring data to life. We will be able to visualise the data in a very intuitive and convenient way, which will help us derive insights in a more efficient way,” said Dr. Lye Kong-wei, Head of Data Science, Grab, and Co-Director, Grab-NUS AI Lab. “Grab is a company built on on-demand transport service. At the end of the day, as consumers, we want it to be reliable, convenient, very safe, and this particular lab is going to do all three by creating powerful AI solutions for that,” said Professor Ho Teck Hua, Senior Deputy President and Provost, NUS, during a media briefing at the launch. So how will the Grab-NUS AI Lab enrich your Grab experience and also make cities smarter and more liveable? Read on to find out! By answering questions such as What is the purpose of a trip? Where does a passenger intend to go from the drop-off location? What will be the likely activity of a passenger at the destination? How long will he or she be staying at the destination?, AI algorithms will help us better understand your needs, intentions and preferences so that we can suggest promotions and services that you want. Here’s an example: “We know that there is a trade-off between cost of travel versus the time it takes to arrive at the destination. For work-related journeys like getting to work on time or travelling between meetings, timeliness is essential, so consumers may opt for GrabCar or JustGrab to quickly get to their destination. However, for rides hailed outside of work hours and on weekends, passengers may be more price sensitive and prefer to use GrabShare for a more cost-effective way of getting about. The use of data and machine learning will help us balance this trade-off in an intelligent and efficient way that appeals to our consumers,” Dr Lye explained. “Grab’s services bring many benefits, and this is one of the benefits – making your life easier,” added said Professor Ho. “Drivers are just as important to Grab. To serve the driver, we also want to develop AI algorithms to understand their preferences. So that when there’s a job demand, we can direct it to the right driver,” said Professor Ng See-Kiong, Deputy Director, NUS Institute of Data Science, and Co-Director, Grab-NUS AI Lab. AI can also help improve driving safety. One of the things the lab will look at is developing change detection algorithms to spot abnormal driving patterns. After spending long hours behind the wheel, every driver is prone to boredom, fatigue and repetitive stress, lower levels of alertness, and in some cases even dangerous driving behaviours. By being able to spot unusual driving behaviour, we can put in place additional safeguards. Traffic congestion in cities across Southeast Asia is some of the worst in the world. Building on Grab’s massive data set, researchers at the lab can develop novel applications that can help transport authorities monitor and optimise traffic flow. For example, detecting train faults and spike in demand for ride-sharing options in real time and routing vehicles to the best points to help alleviate the issue. “Traffic is something governments are very concerned about. This is one area where I believe Grab and NUS together can make some breakthrough innovation and develop good solutions for governments to manage traffic better,” Dr. Lye added. 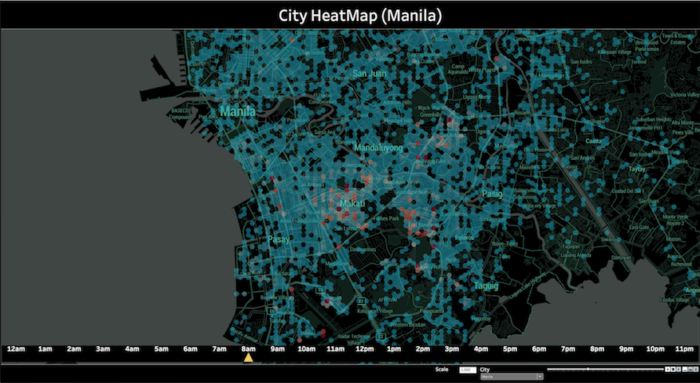 The above city heat map can provide both Grab and governments insights on how to improve traffic flow during peak hours. Detecting traffic anomalies (e.g. traffic jams) or events (e.g. road lane blocking due to road works or accidents) in real time can be used to recalculate ETAs or ETTs or to propose alternative routes for drivers and at the same time help decongest the affected road network. Roads in Southeast Asia can be complicated. The lab will develop algorithms to improve precision and accuracy in mapping pick-up points and trackingmoving vehicles to help passengers and drivers get from point to point with greater ease and efficiency. – Learning and recommending visual local landmarks at points of interest. While newly launched, insights from the Grab-NUS AI Lab can already make a difference for Philippines starting today. For example, our data shows that Cubao Edsa to Roxas Blvd is the busiest route in Manila during peak hours. If this route would be better served by more shared transport solutions, such as buses, trains, GrabShuttle, GrabShare or GrabHitch, we could bring travel time during peak hour down by 1/4th or from 90 to 68 minutes. “At the end of the day, shared mobility is not about reducing number of vehicles per se but optimising usage to reduce congestion,” said Professor Ho.